UP TET 2018 Result : Uttar Pradesh Basic Education Board has recently conducted the UPTET exam (Uttar Pradesh Teachers Eligibility Test) 2018 i.e., on 18th November and the results of the UPTET exam will be available on December 8th (Tentative) which is as per the official sources. So, the candidates who have appeared for the UPTET exam 2018 in level 1 and level 2 papers can stay tuned with the official site till the end of December to check out your results. 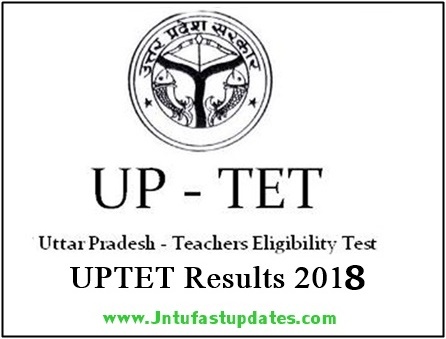 The complete details of the UPTET Result 2018 are as follows. UPBEB UPTET Paper 1 & 2 Results 2018 Release Date :UPBEB is the basic education board which conducts the UPTET exam every year for the eligible aspirants. UPTET exam is conducted to recruit the eligible candidates for the teacher jobs in the Uttar Pradesh State in both primary and the Upper Primary level i.e., in government schools. This year after the release of the notification, lakhs of candidates interested in the teacher jobs has applied for this recruitment before the last date of filling the applications. As per the reports from UP education board this year hugely 7 lakh above candidates were enrolled for UPTET examination. Hugely 14 lakh candidates were applied for UPTET paper 1 while 5 lakh candidates appeared for UPTET Paper 2. The UPBEB has conducted the examination in nearly 858 examination centers across the UP state. All these candidates have received the Admit card for the UPTET exam and completed the exam successfully on 18th November 2018 in both primary and upper primary level papers that they have applied. All those candidates are now eagerly waiting for the release of the UPTET results to check out their marks and to know whether they are qualified in the exam or not. As per the official sources, it is said that the UPTET results will be declared On December 8th. So, candidates are advised to stay patient until that time. Here we will update the information as soon as the results are available on the official website and then candidates can check out them following the procedure or steps given below. Hence, stay tuned with this site for regular updates. How to Check Uttar Pradesh TET Paper 1 and Paper 2 Result 2018? Go to official website upbasiceduboard.gov.in. Now, on the home page of the website, check for the UPTET Exam Results 2018 and then open the link. Fill all the required detail such as roll number or registration number and date of birth etc. Finally, click on submit to submit those details. Finally, your UPTET Scorecard or Results will be displayed on the screen. You can check your results; also take a print out of it and save it for your future reference. Along with the UPTET results, the board will also declare the Merit list of the qualified candidates in the UPTET exam 2018 for both paper 1 and paper 2 and they will be available on the official website. Hence, candidates who have qualified in the exam can also refer the merit list to know whether you stand in the merit list or not. Candidates’ who have been listed in the merit list will have more opportunities to get selected for the further rounds and for the final selection criteria of the teacher’s post this year. So, the candidates are advised to know these details along with the merit list. Those candidates who have written the UPTET exams this year will be shortlisted based on the cut-off marks that the board has prepared to shortlist the eligible candidates for the further rounds of selection process. Here are the cut off marks for various categories. So, candidates check them out and estimate your expected marks with the help of this cut off marks and the answer key answers that have been issued recently. UPTET Cut Off marks for SC/ST candidates is 55% i.e. 82 marks and for general candidates, it is 60% i.e., 90 marks for both paper I and paper II. Hence, as the answer key is released check the answers and calculate your marks and check whether you meet the cut-off marks to know whether you are qualified in the exam or not. General Category Candidates who secure 60% marks in the examination will qualify for the UPTET Examination. Qualifying Marks for The OBC/SC/ST and PWD candidates is 55%. 1.1 How to Check Uttar Pradesh TET Paper 1 and Paper 2 Result 2018? I got 89 marks . 8 December tak up tet 2017 ka result aa jayega.